Alfred Young Nutt was born on 5 May 1847 at Barrow on the Hill, Leicestershire, the youngest of 15 children. He left school at 14 to become an architectural pupil with an architect and surveyor in Leicester, where he met Harry Ward, the artist who was to become a close friend, fostering Nutt’s talent for sketching and painting. In 1867, he entered the office of works at Windsor Castle as a draughtsman, upon the recommendation of Lord John Manners, third son of the fifth duke of Rutland. During his time in the office, he was involved in the extensive changes being made to St George’s Chapel. 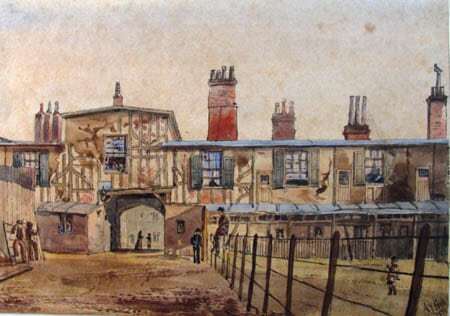 This watercolour, dated 1870, shows the dilapidated state of the Horseshoe Cloisters at that time. The boarding on the left of the painting hides the work being carried out on the West Steps in order to create a ceremonial entrance to the Chapel, completed in 1873. The painting shows an enclosed walkway and doors on the first floor level onto the roof of the walkway. As a result of the state of decay in the Horseshoe Cloisters, Sir George Gilbert Scott was employed to restore the buildings to their former glory, and this work was carried out between 1870 and 1871. In 1873, Nutt applied for the vacant post of Clerk of Works of Windsor Castle, but was rejected on grounds of youth and lack of relevant experience. However, he secured appointment as Surveyor to the Dean and Canons, a post which he held through annual reappointment until his retirement in 1912. St George’s Chapel Archives holds plans, drawings, memoranda, correspondence, accounts and other records relating to his time here, showing the volume of work he was involved in. Much of his work consisted of routine maintenance of the Chapel and other buildings of the College, but there were special projects too. Between 1880 and 1886, the exterior of the south side of the Chapel and the nave roof were restored, during which time the statues were placed in niches of the buttresses. In 1892, the Naval Knights were disbanded, and A.Y. Nutt undertook the conversion of their quarters at Travers College in Datchet Road to become St George’s School. Many of the Chapel monuments were designed by him during his time as Surveyor, including those to Dean Grenville and Lieutenant Colonel Pickard, considered by Dyson’s Guide as “the most handsome and appropriate of all, it reaches the very perfection of monumental art”. In 1901, he at last secured the post of Clerk of Works of Windsor Castle and held the post concurrently with that of Chapel Surveyor until 1912. In 1912, he was told that according to Civil Service regulations, he would have to retire on his 65th birthday later that year. Despite fighting against this, he was forced to retire, ending 38 years of surveyorship of the Chapel. He moved to Slough, where he continued in private architectural practice until his death on 25 July 1924. In 1936, a memorial to him was placed in the north choir aisle of St George’s Chapel. In an article for the local newspaper following his death, an anonymous correspondent described Alfred Nutt as “the soul of honour, integrity, generosity and unselfishness, and an example of a fine-souled English gentleman”. A blue plaque is due to be unveiled at his former home at 63 King’s Road, Windsor.